Rain is finally here and wat beautiful sight & smell, loving it. Here to post another Explosion Box i made for my bro-in-law's marriage. He wanted to gift the ring in this box and so i made it accordingly. Look at that gorgeous bow, thanks God i got it right. Below are the panels in the second layer, added some words to the photos and 'pinned' it with paper clips. Hope u liked it guys, do give ur thoughts on this. lovely box, Sujana and CONGRATULATIONS for the win!! congrats sujana....the box is so pretty n well decorated... n d bow is perfect dear. Hi Sujana! A lovely gift within a lovely gift :) Hope you got it :)) And I'm so happy that you won at Itsy bitsy, because I already decided that when I first saw your ensemble :) and what a work you've put behind it girl!! You truly deserve it!! Congrats to the lovely couple too! lovely box Sujana!! 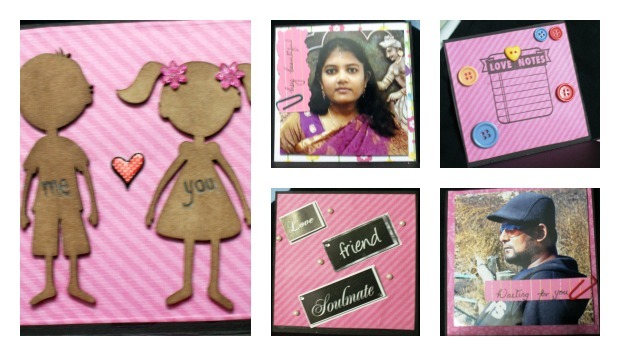 And a huge congrats for the win at itsy bitsy...the birthday creations were really really wonderful. thats a lovely box :) and congratulations on ur win! What a lovely box Suajana!! ThanQ so much for playing along with us DCAM CHALLENGE #2 SHABBY IS CHIC! on winning Itsy Bitsy Challenge..Enjoy your win..n do keep winning ...! This is so cute and lovely. thanks for playing along with us at DCAM Challenge Shabby is Chic. This is a gorgeous exploding box!! Love the boy & girl!!! Thanks for joining us at BGC!! Thats a gorgeous box , Thanks for playing along at DCAM CHALLENGE #2 SHABBY IS CHIC!